1. less than 3 years 2. 3 years. 3. more than 3 years. 1 1. less than 3 years 2. 3 years. 3. more than 3 years. 2 1. less than 3 years 2. 3 years. 3. more than 3 years. 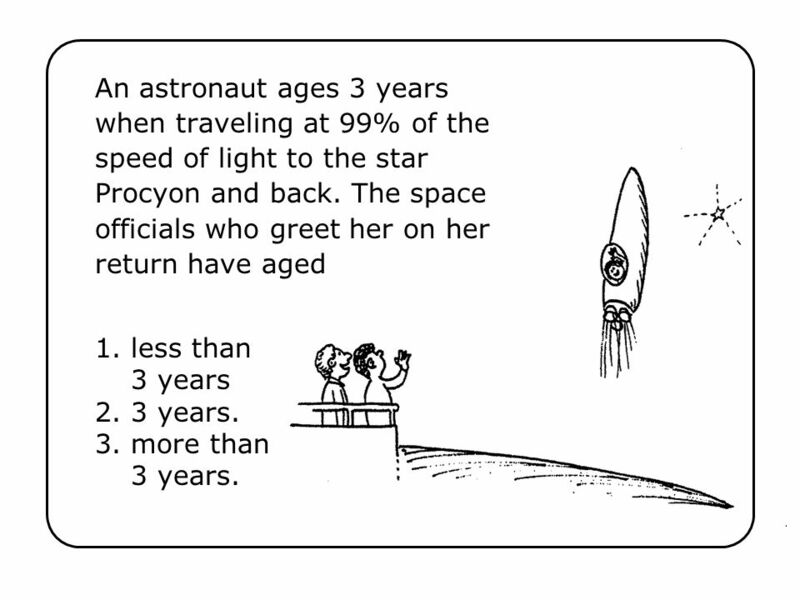 An astronaut ages 3 years when traveling at 99% of the speed of light to the star Procyon and back. The space officials who greet her on her return have aged 1. less than 3 years 2. 3 years. 3. more than 3 years. Ch 35-1 Answer: 3 The 3 years experienced by the traveling astronaut is considerably less than if she had stayed at home. The stay-at-homes age more than 3 years—21.2 years, to be exact. 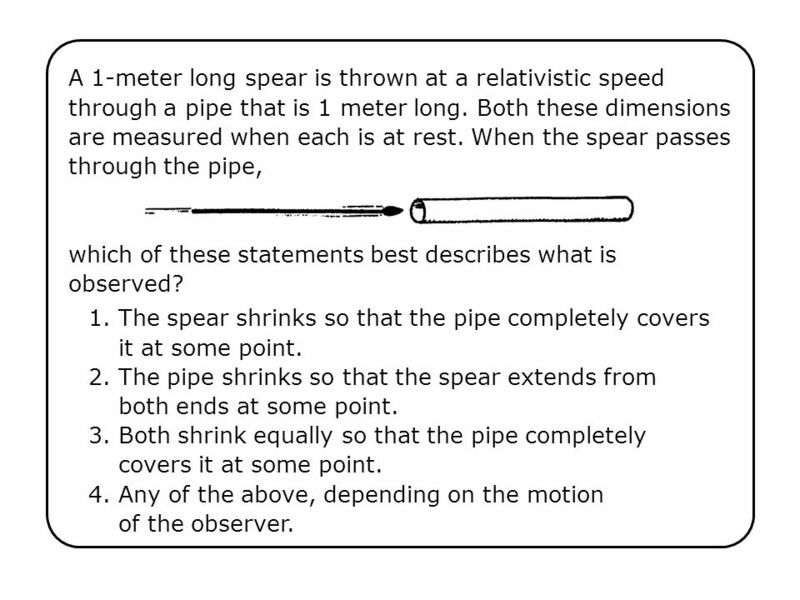 4 A 1-meter long spear is thrown at a relativistic speed through a pipe that is 1 meter long. Both these dimensions are measured when each is at rest. When the spear passes through the pipe, which of these statements best describes what is observed? 1. The spear shrinks so that the pipe completely covers it at some point. 2. The pipe shrinks so that the spear extends from both ends at some point. 3. Both shrink equally so that the pipe completely covers it at some point. 4. Any of the above, depending on the motion of the observer. Ch 35-2 Answer: 4 Observe from a rest position with respect to the pipe and at some point the contracted spear will be completely covered by the pipe. Or travel along with the spear and you’ll see that both ends of the spear at some point extend from the contracted pipe. Or move between the spear and the pipe at a certain intermediate velocity, and you’ll see both the spear and the pipe contracted the same amount. So what really happens is relative—it depends on your point of view, or frame of reference! Download ppt "1. less than 3 years 2. 3 years. 3. more than 3 years." Einsteins Special Theory of Relativity. 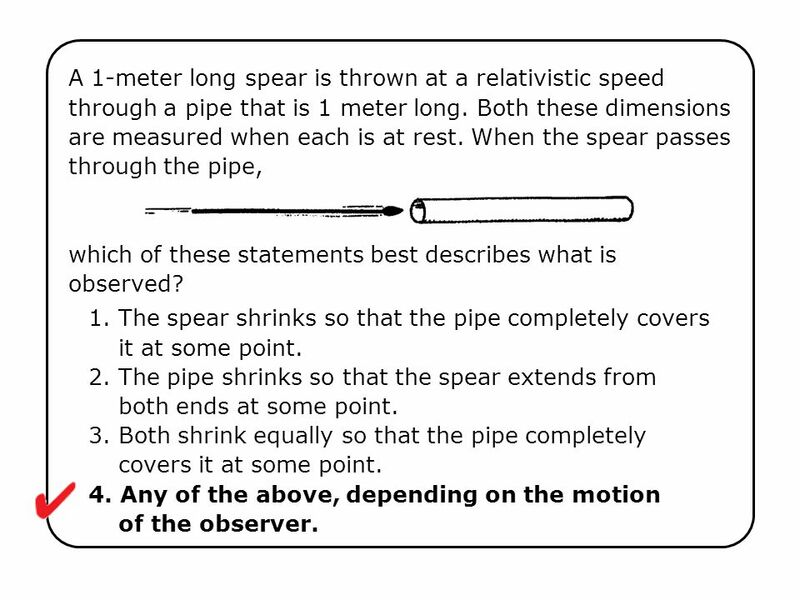 Relative Motion ALL motion is relative Speeds are only measured in relation to other objects No way to determine. Relativity H2: Concepts and postulates of special relativity. INST 240 Revolutions Lecture 9 Directions in Spacetime, Twin Paradox & Vectors. PLAY Physics Con-Seal From RegentsEarth.com. Q37.1 As a high-speed spaceship flies past you at half the speed of light, it fires a strobe light. An observer on board the spaceship measures a spherical. The Nature of the Universe The universe began 13.8 billion years ago with the “big bang”. At this moment in time, all of the matter and energy in the. 1 Special Relativity (Ch 37) Modern physics special relativity quantum mechanics Both were developed to explain the “few remaining puzzles” of classical. Linear Motion 1 Aristotle 384 B.C. - 322 B.C. Galileo 1564 - 1642.